Calling all food and wine enthusiasts! WGBH is excited to host the fifth season of the Taste of WGBH Food & Wine Festival, October 5-8, 2017. We are again collaborating with the best chefs, producers, wineries and breweries to deliver the finest food and wine in the region. The four-day festival will include an Opening Chef’s Gala Reception, The Artisan Taste, Brunch Bar and the return of the WGBH Food Fight. Thousands of guests are expected to join us for a weekend full of delicious festivities. We need your help to ensure this year’s festival is even bigger and better than last year’s. Volunteer positions range from set-up crew, on-site event assistants and breakdown crew...this will be an amazing opportunity to get on-site events/festival experience and help produce one of Boston's most fun food festivals! 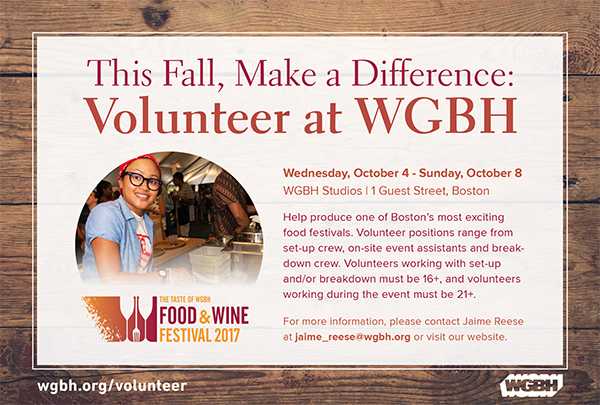 Please review all Taste of WGBH: Food & Wine Festival volunteer activities listed below and email me at jaime_reese@wgbh.org no later than Friday, September 29 if you'd like to help. Please note that volunteers should be comfortable standing for 4-6 hours. Volunteers working with set-up and/or breakdown must be 16+, and volunteers working during the event must be 21+. Responsibilities of a Set Volunteer include setting up tables, steaming tablecloths, deploying materials to different vendor stations and placing signage around Calderwood Studio. Set volunteers must be able to lift at least 20 pounds and be able to be on your feet for an extended time. The festival kicks off with the Chef’s Gala Reception featuring the cuisine of 21 award-winning chefs. This magical evening features select pairings of wine and craft beer for each enticing dish; live music; and sweet surprises tucked among the linen-clad tables, beautiful décor and dazzling lights. Those with VIP access will enjoy special experiences including access to the Audi patio, tastings in the VIP Lounge and an exclusive gift. Responsibilities of a Set Volunteer include setting up tables, steaming tablecloths, deploying materials to different stations and placing signage and festive décor around the Artisan Taste tent in the back lot. Set volunteers must be able to lift at least 20 pounds and be able to be on your feet for an extended time. Responsibilities of a Set & Greeter Volunteer include last-minute set-up tasks and greeting and leading Artisan Taste exhibitors to designated area within the tent. Volunteers will also assist The festival vendors in finding their spots. This Grand Tasting event showcases tasty bites from nearly 30 of New England’s best chefs and more than 100 premium adult beverages from around the world. Live musical guests will be featured along with book signings from popular chefs and cookbook authors. Guests will enjoy live demos in Culinary Theatre and the marketplace with goods from 14 vendors, all while supporting WGBH, the local culinary community, and small farmers. The evening is rounded out by the unveiling of the 2016 WGBH Culinary Stewardship Awardee and the 2017 WGBH Youth Culinary Award. Please share any prior customer service, culinary and/or food service experience...a definite PLUS. Breakdown Volunteer; Breakdown volunteers will receive a FREE ticket to the GWBH Food Fight Event on 10/8 from 5pm-8pm. Responsibilities of a Breakdown Volunteer include folding and stacking tables, removing tablecloths, returning materials to the catering kitchen, taking down signage around the tent, etc. Breakdown volunteers will receive a FREE ticket to the GWBH Food Fight Event on 10/8 from 5pm-8pm. Breakdown volunteers must be able to lift at least 20 pounds and be able to be on your feet for an extended time. Responsibilities of a Set & Greeter Volunteer include last-minute set-up tasks and greeting and leading Brunch Bar exhibitors to designated area within the tent. Volunteers will also assist festival vendors find their booths. Set volunteers must be able to lift at least 20 pounds and be able to be on your feet for extended time. Ticket Sales/Will Call, Merchandise Sales, Membership Sales, Wrist Band Greeter, Glass/Program Distributor, CErtified TIPS Pourer/ID Check, Bag Check, Food Prep, Community Ambassador, Table Runner (refill water pitchers, replace ice, clear trash around booths), VIP Lounge Assistant (restock magazines, replenish water station, keep area tidy), Volunteer Photographer and Photographer’s Assistant. WGBH must be 21+ to participate. This Brunch Grand Tasting showcases an impressive array of popular restaurants and award-winning chefs serving up delicious dishes side-by-side with refreshing wines, special craft beers and ciders and juicy cocktails made with local spirits. The event features live cooking demos, panel discussions and talks from national and local celebrity chefs. Please share if you’ve had prior customer service, culinary and/or food service experience...a definite PLUS. If our Chef’s Gala takes you down the Red Carpet, our Food Fight moves you with a Magic Carpet! Be transported beyond borders through the streets of Bangkok, alleyways of Oaxaca, and the dusty roads of the East Bank to enjoy delicious bites from 15 chefs delivering their best interpretation of Global Street Food. The Food Fight offers exciting activities for attendees culminating in awarding one chef the title of champion, chosen by the crowd. Located on the WGBH Television and Recording Studio lot in Boston. Responsibilities of a Breakdown Volunteer include folding and stacking tables, removing tablecloths, returning materials to the catering kitchen, taking down signage, etc. Responsibilities of a Breakdown Volunteer include folding and stacking tables, removing tablecloths, returning materials to the catering kitchen, taking down signage around Calderwood Studio, etc. The fifth annual Taste of WGBH Food & Wine Festival helps to support the great educational and cultural programming on WGBH. WGBH members, community friends, and a host of celebrity chefs will mix and mingle around their favorite topic: good food. Be sure to join us this year! Think your friends and family may also want to volunteer for this event? If so, feel free to pass this information on to them, too!